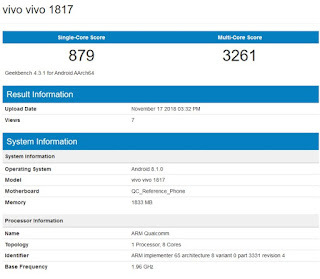 Vivo latest smartphone bearing a model number Vivo 1817 is listed on the benchmarking website Geekbench, and it seems to be the entry-level smartphone, if the report is to be believed. The benchmarking site reveals some key specifications and features of the device that seems to be entry-level, and is likely to be a less expensive version of the Vivo Y93 that bears the model number Vivo 1818. Though both the devices are identical, Vivo 1817 comes with 2GB of RAM rather than 3GB of RAM like Vivo 1818, and will be powered by an octa-core Qualcomm SoC processor. On the software front, Vivo 1817 runs on Android 8.1 Oreo out-of-the-box, , like the rest of the phone in the Y-series and the listing also confirms that Vivo 1817 score 879 in single-core tests, and 3,261 in multi-core tests…….Read More>.